Yep, my little Lucy is officially looking for a home! Below is her adorable bio the cat marketing team at Austin Pets Alive! helped write up for her as well as a little video I put together of her. Please help her find a forever home and spread the word about this amazing lady! 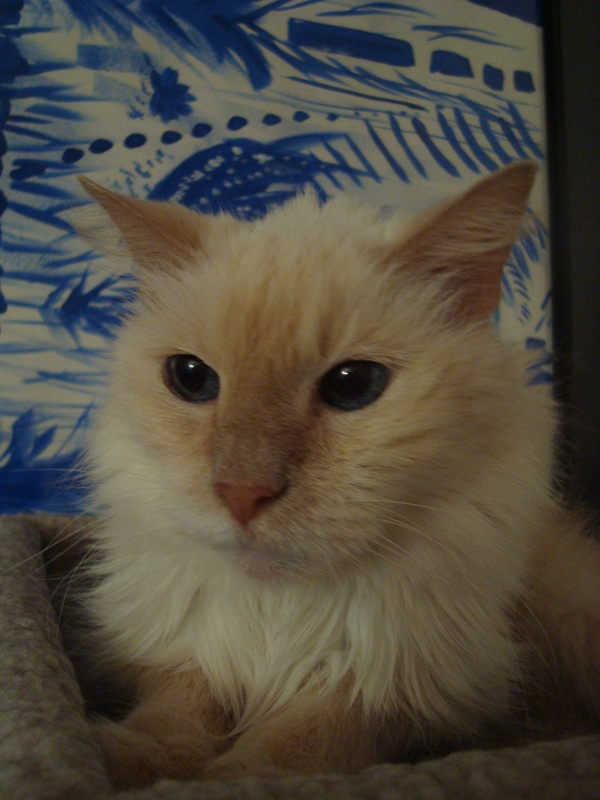 This beautiful feline specimen is a Flamepoint Siamese. Lucy may be 12 years old, but she is an ideal lap kitty and reading partner. She LOVES being pet and headbutts all the time. Because of her maturity, she is not super needy, pushy or demanding, but definitely wants to spend time with you and be near you. Lucy plays a little with strings and loves her scratch post at times, but is normally pretty mellow. Lucy is currently in a foster home with another gentle cat and a friendly dog and Lucy doesn’t seem to mind too much. As long as other pets are respectful and don’t try to engage in too much play, Lucy is fine. Lucy has been diagnosed with IBD (irritable bowel disease), which sounds worse than it actually is. It’s an auto-immune disorder where parts of her intestinal tract have become inflamed, but are managed with a gentle prescription food, both the canned & kibble varieties (Purina EN available through your veterinarian and costs the same as most high-quality cat foods). Her foster currently keeps a large, shallow litterbox in a tiled bathroom so that if Lucy has any accidents it’s easy to clean up. This doesn’t happen often, but gives everyone peace of mind. Despite her occasional tummy troubles, Lucy has a very sweet, quiet “meow” that comes out when you are getting her dinner ready or sometimes when she wants to say hello and receive some affectionate pets. Overall, this mature gal loves to lounge around and enjoy sunbeams more than run around or play. Lucy has been microchipped, vaccinated, tested negative for FIV and FeLV, and is given her monthly flea preventative. To learn more about Lucy contact adopt@austinpetsalive.org.